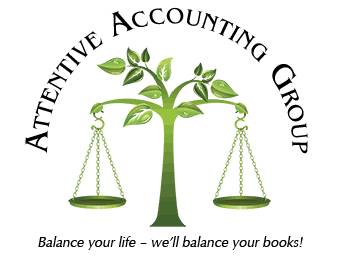 Attentive Accounting Group offers a variety of ways client’s can work with us. Whether you have ongoing or occasional need, we can develop a relationship that works.Below are a few examples of our client relationships. To discuss how we can work with you, please contact us. John has retail stores in multi-states. He did not have time to do any of his day to day accounting. He wants quarterly financial statements. QuickBooks: We set John up using QuickBooks Online and cleaned up his chart of accounts and general ledger. QuickBooks online gives him and us 24/7 access to his data. Bookkeeping: We download the bank statements and credit cards statements directly into QuickBooks. John pays his bills but we record everything. We reconcile the balance sheet accounts and review the P&L for proper posting. Any item that looks out of the ordinary we send him a list of questions that he answers and sends back to us via e-mail. Reporting: John does not have the time or interest in going into the QuickBooks file. Therefore, quarterly we send him in an excel file financial statements (income statements vs. last year, balance sheet, general ledger) and we send each balance sheet account reconciled on a separate worksheet within the excel file. John pays a flat fee per month per company. It is much lower than what he would have to pay to have someone on his staff perform these accounting functions. Marc owns a rather large retail store and has an accountant on staff. The accountant does the accounts receivables and accounts payables and reconciles the bank. QuickBooks: Marc is set up on QuickBooks Premier desktop. We have remote access and can work on his QuickBooks any time. Outsourced Controller: We are Marc’s part-time Controller. We perform the following functions for Marc: Payroll, balance sheet reconcilements, P&L review, month end entries and any pertinent item that needs a higher level of attention. We do the worker’s comp audits, IRS correspondence, 401K audit prep, insurance review, human resources, invoicing, collections, internal controls etc. Accounting background and came to us to set up their accounting system and the best method to handle the day to day financial activities. QuickBooks: We set them up on QuickBooks Online. We used the class function to accommodate the government reporting that was required. One class was unallowed, whereas the other was different projects that were federally funded separately. Data Entry: We assisted in hiring an employee on-site and training them to use QuickBooks, therefore they can enter the bills and pay them into QuickBooks. Bank reconciliation: She emails us her bank statements so that we can reconcile them. Accounting: Once a month, Victoria sends us the employee’s time sheets. We log into the payroll system to run reports. Government contracts require that all employees’ hours are accounted for. We set up general ledger accounts and classes to handle this reporting requirement. We can set up QuickBooks to accommodate almost any criteria. Gary runs a very large heating and Air Conditioning Company. He has a person who is in charge of the office and bookkeeping. We came in initially and cleaned up the chart of accounts and general ledger. Then we trained his bookkeeper on how to use QuickBooks. QuickBooks: Gary is on a desktop version since there is only one person that has to access the QuickBooks. Review: We come in every quarter to reconcile the bank statements, reconcile the balance sheet accounts and to review the entire general ledger. As-needed support: Gary and his bookkeeper call us when they have accounting questions or if they do not have time to do the daily accounting. We have helped enter the credit card statements etc. Gary is in control of how much or how little he uses our services based on his needs. Brian is a very busy person who travels 95% of his time performing. He does not have time to do any of his accounting. QuickBooks: We set Brian up on QuickBooks online. Therefore, his data will be secure and backed up instantly. He can access his data from anywhere in the world as long as he has an internet connection. Accounts Payables and Accounts Receivables: Brian’s bills and payments come directly to our office. We process and record all payments and checks. We follow up on collections when needed. Bookkeeping: We download the bank statements and record all of the transactions. Account reconciliations, journal entries and financial reports are completed on a weekly basis. Taxes: The tax accountant has access to the QuickBooks Online. Once the return is completed, the tax accountant sends us the adjusting entries for the year-end and we update the general ledger. Lianne did well delivering services for her client, but did not know how to maintain books or have any background in accounting. She bought QuickBooks for Mac and called me up to set it up and train her in using it. Set up and Training: We set up her QuickBooks customized to suit her business. Then we trained Lianne on how to bill her clients, pay bills, do bank reconcilement and record her monthly expense report. We talked to her about keeping a mileage log and how to keep her accounting records. As-needed support: Lianne has called us to come train her a few more times. Due to her wishing to spend more time on her business then on the accounting, she will have us do the bank reconcilement and financial statements. She did not expect to outsource any of her accounting, but this solution works best for her financially and for her growth of her business. Memorized Reports – The client can get a customized report instantly. We set up the reports that can give the company accountant or owner useful information to run their business. Organized and clean set of chart of accounts – A disorganized list of chart of accounts makes the reports less user friendly and takes the bookkeeper/accountant more time to record the daily financial activities.